REDD+ is a United Nations program, and part of the Paris Climate Agreement, that allows industrial nations to fund forest protection in tropical developing countries as a greenhouse gas emissions mitigation strategy. Some indigenous groups resisted REDD+ inclusion in Paris, expressing concerns that it could result in their claims to traditional lands being negated by governments and corporations. Some feel that REDD+ safeguards against such land grabs are weak, and that indigenous groups will be left out of REDD+ project planning by national governments. The Wapichan indigenous group has spent years petitioning Guyana’s government to recognize their traditional land claims, and now worry that a REDD+ project known as the Low Carbon Development Strategy (LCDS) could deprive them of control of their lands. A recent breakthrough announcing formal government/Wapichan land talks could bode well for REDD+ in Guyana and around the world. On December 12, 2015 representatives from 196 nations approved the Paris Agreement to address the challenges of climate change. Proponents praised the agreement as a long-term pathway to curbing global warming and for the future of multilateral climate action. REDD+ is a prominent feature of that final agreement. The “Reducing Emissions from Deforestation and Forest Degradation” program was originally proposed as part of the UN toolkit for reducing global warming in 2005. It is important because deforestation and forest degradation account for roughly 10% of global greenhouse gas emissions. The program puts a financial value on the carbon stored in forests. It provides a market mechanism for wealthy developed nations with high carbon emissions to offer an economic incentive to tropical forest nations in the developing world to keep trees standing — allowing those forests to act as carbon reservoirs to slow climate change. The UN currently supports 64 partner countries in building capacity to establish national REDD+ initiatives. Despite early enthusiasm, support for REDD+ faltered somewhat in recent years as questions were raised over its long-term viability — particularly concerning ongoing financing during its initial implementation. Many supporters feared that REDD+ couldn’t continue if not part of the final COP21 climate agreement. The reaffirmation of the initiative in Paris came as a relief to the program’s biggest boosters, including the Coalition for Rainforest Nations. REDD+ inclusion in the Paris Agreement “is a sign to countries — both tropical forest countries who might implement REDD and donor countries — that this is a priority going forward in the post-2020 climate framework, and [that] we need to be taking actions [to protect tropical forests] sooner rather than later,” said Chris Meyer, Senior Manager at the Environmental Defense Fund (EDF). But this news wasn’t welcomed by everyone. Throughout the Paris talks, REDD+ opponents vocalized their critiques of the mechanism. The most serious disapproval came from indigenous groups such as the Indigenous Environmental Network (IEN), a grassroots organization. 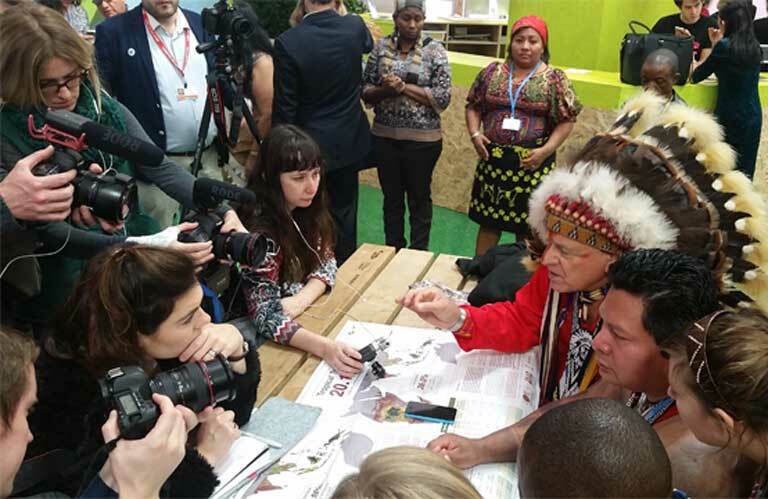 “One of the issues that we are coming here to condemn,” Tom Goldtooth, Executive Director of IEN said at COP21, “is the issue of REDD as part of a market system that is going to end up being a crime against humanity and Mother Earth.” IEN and some other indigenous groups claim REDD+ allows wealthy nations to escape their responsibility for cutting carbon emissions at the expense of indigenous rights and traditional land-use practices. While some indigenous groups support REDD+, others complain that they have not had a large enough say in REDD+ negotiations and implementation, though they were invited to participate in the REDD process at past COP meetings. The major sticking point is that REDD programs will be spearheaded by national governments, which some indigenous groups view with distrust. In an area of the COP21 venue open to the public, indigenous leaders from Africa, Latin America, and Asia presented research from the Woods Hole Research Center showing that over 20% of carbon stored in tropical forests is within indigenous territories. This research was intended to demonstrate the importance of indigenous peoples as protectors of aboveground carbon stocks and the imperative of securing their legal rights to these lands. Indigenous groups often lack land deeds, a legal loophole governments and corporations have used in the past to seize traditional lands. The concern of indigenous peoples is that without clearly defined legal protections, REDD+ and similar initiatives could open the door for land grabs of their territories. REDD+ backers counter that the mechanism does contain some safeguards that could help indigenous groups secure permanent land titles, and which in theory, would ensure that REDD+ initiatives improve the plight of indigenous communities, potentially enabling them to finally secure recognition of traditional land rights and tenure. 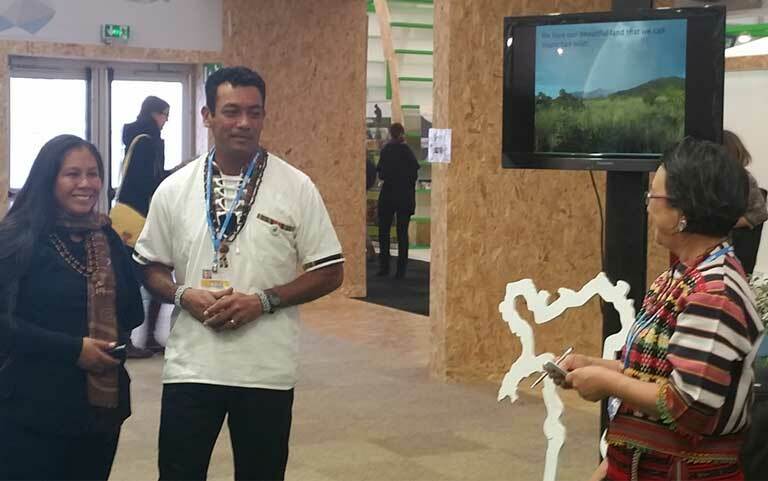 Nicholas Fredericks prepares to make a presentation highlighting Wapichan community-led forest management at COP21. The Wapichan live in the Amazon rainforest of Guyana. Photo by Mitch Paquette. Some indigenous groups remain skeptical. Several of their representatives at COP21 argued that indigenous groups who become involved in REDD+ projects, without first establishing legal protection of their lands rights, face a tremendous risk of losing the use and/or ownership and control of their lands — which could be disastrous to the traditional livelihoods of forest peoples. Now that REDD+ has been firmly enshrined as an integral part of the Paris Agreement’s climate change mitigation plan, and with funding flowing, indigenous communities will be faced with a dilemma. Do they risk possible exploitation by accepting funds through REDD+ in the hopes of bettering their communities? As importantly, will they have a choice? One group immediately faced with a decision regarding REDD+ participation is the Wapichan people of Guyana. In 2015, the Wapichan and the South Central Peoples Development Association (SCPDA) were awarded the Equator Prize by the United Nations Development Programme (UNDP) for their community-led efforts to secure legal titles to their ancestral lands and sustainably manage forest resources. The Wapichan have been working to foster dialogue with the Guyanese government over their land rights since 2002. That’s when they began drafting a grassroots proposal to document their traditional occupation and land use. Utilizing advanced GPS and Smartphone technology, the group created a detailed map of its territory encompassing 17 Wapichan communities. These early efforts were largely funded by the European Union and international conservation NGOs such as Size of Wales. 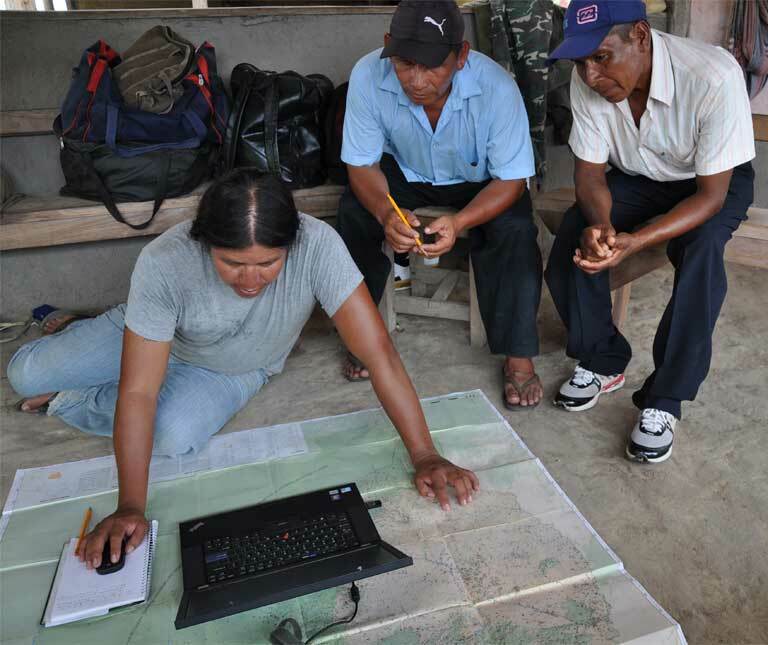 Wapichan community members working on a digital map of their traditional lands. Photo by Tom Griffiths, FPP. On completing the territorial mapping project, the Wapichan held more than 80 community meetings between 2008 and 2011 to document traditional knowledge and traditional rules for resource use and management to be included in their final proposal to the Guyana government. Through this process, they established collective agreements for sustainable land use and systems for managing common resource areas and conserved forests. After more than a decade of planning and research, the Wapichan produced a mutually agreed upon framework for how they will continue to practice their traditional ways of life, while working towards self-determined development in a way that manages natural resources sustainably. With this proposal, the Wapichan hoped to demonstrate to the government their deep connection to the lands they claim, as well as their ability to maintain and protect them. Wapichan persistence finally paid off last month when Guyanese President David A. Granger agreed to formal land talks. Scheduled to begin later this year, the discussions will hopefully resolve the Wapichan claim over their ancestral territory, “an issue which has been pending now for 50 years since [Guyana’s] independence from Britain in 1966,” said Tom Griffiths of the Forest Peoples Programme. Guyana government authorities did not respond to a request for an interview for this story. 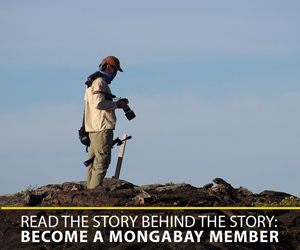 While awaiting resolution of their land claims, the Wapichan continue to tap into traditional and modern knowledge to develop new ways of protecting their territory against emerging threats from mining, illegal logging and agribusiness. Since submitting their proposal, they have added a community-owned drone to their already effective local monitoring system. The drone is capable of capturing detailed images revealing forest loss and illegal activities. The group hopes to share this technology and their land possession/protection strategies with other indigenous communities in Guyana so that they can develop similar systems. 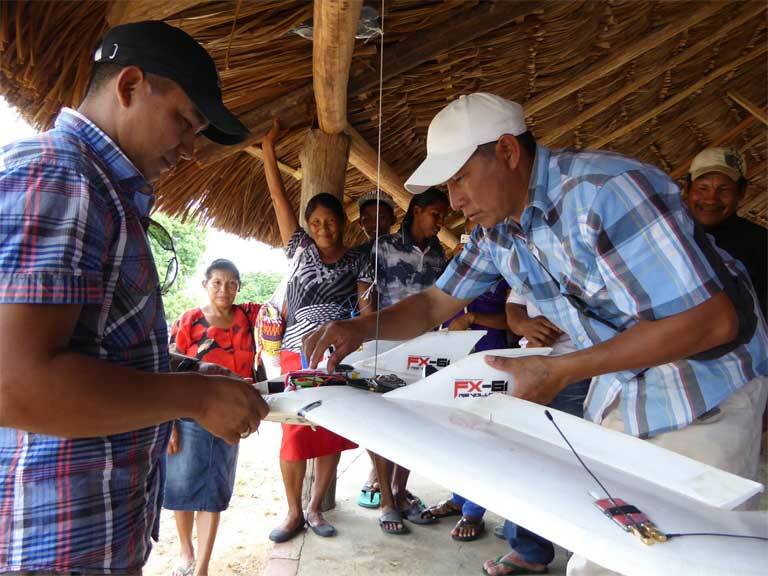 Community members build a drone for use in mapping and monitoring Wapichan lands. Photo by Tom Griffiths, FPP. So far, the Wapichan people have relied heavily on external and impermanent sources of funding for their community-led land protection efforts, and they would greatly benefit from contributions from other sources. The government is pressuring the indigenous group to opt into a Guyanese national UN-REDD+ initiative known as the Low Carbon Development Strategy (LCDS). Developed in 2009, LCDS is one of the first REDD+ programs of its kind, funded largely through a partnership between Guyana and Norway. It has been called a test case for REDD+ implementation and could set a precedent for how REDD+ programs are mobilized in other developing nations. But the Wapichan people and other forest communities are hesitant to take part in Guyana’s LCDS. “Although they have developed a mechanism of how communities can opt into these programs,” Fredericks said, “it was developed more from a national level and was not done in proper consultation with us, so we see that as a big risk if we opt into this mechanism.” He and the Wapichan group are still unclear how participating in the LCDS will benefit them, what sort of compensation they will receive, and if they will be able to opt out of the program in future. While they concede that they could gain advantage from LCDS funding, they are worried about the level of uncertainty involved when it comes to binding themselves to a national government that has not yet granted them clear land rights, and which also rejected their input into creating the LCDS program. A major concern is that the federal government will completely control the LCDS, depriving the Wapichan of autonomy over the lands they’ve worked so long to protect. According to Fredericks, Guyana officials are set to revise the LCDS either this year or next, and he hopes they will recognize his community’s land rights and land use proposal and respect the voice of his people. If it does, the LCDS could help the Wapichan become better funded and equipped to defend their forests and livelihoods against emerging developmental threats and to maintain the future integrity of the ecosystem to which they lay claim. If the upcoming government talks and REDD+ mechanism fail to offer a pathway to Wapichan territorial sovereignty, that could negate their hard-fought effort to safeguard their traditional lands, and could put the land rights of all indigenous communities in Guyana at risk. Looking at the bigger picture, Guyana hopes to be one of the first nations since the Paris Agreement to implement REDD+ in a big way. A government failure to include the Wapichan prominently in the LCDS could jeopardize that goal. Alternatively, if the government recognizes Wapichan territorial claims and invites the group’s full participation in the LCDS, Guyana could play a leading role in demonstrating the effectiveness of REDD+ indigenous rights safeguards. Whatever the outcome, events in Guyana could influence the future success or failure of REDD+ and its ability to not only protect the world’s tropical forests but also the indigenous communities best positioned to preserve them. 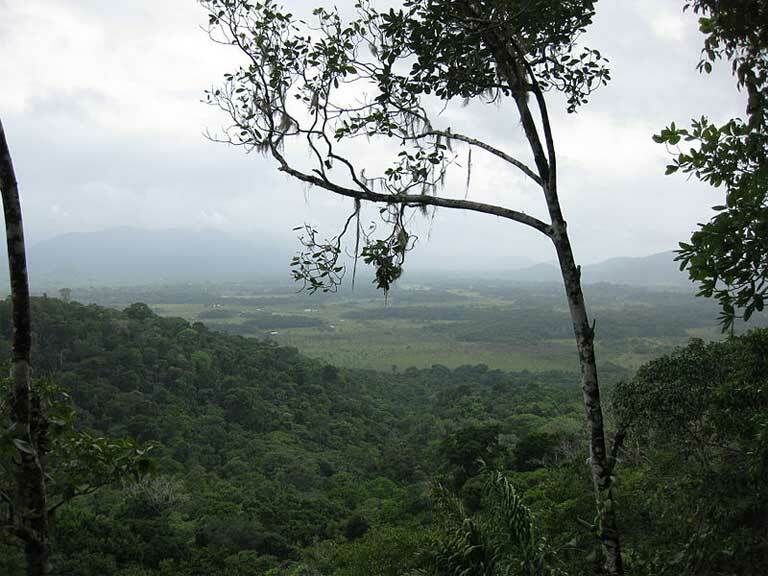 The Guyana rainforest: valuable to the Wapichan traditional lifestyle, to Amazon biodiversity, and as a repository for carbon and as a hedge against escalating climate change. Photo: Wikimedia Commons. Permission granted to copy, distribute and/or modify this document under the terms of the GNU Free Documentation License, Version 1.2 or later.